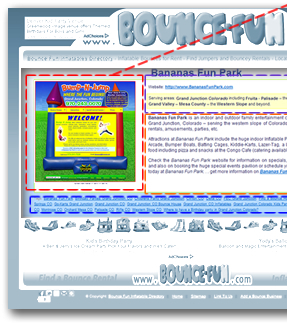 Bounce Fun Inflatable Business Website - Activate a Business Listing and Begin Advertising Today! Example: New York NY, San Diego CA etc. Description of your inflatables business. Please include a description up to 100 words. and any specials or packages you offer or events you specialize in. 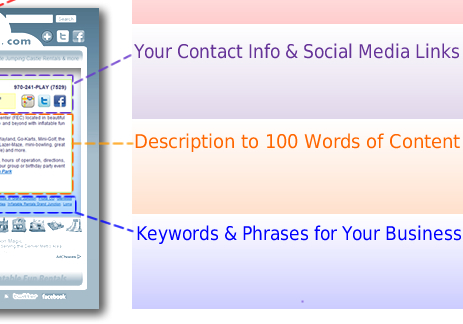 Enter Approximately 10 Keyword phrases for your business. "Bounce Slide Party Rentals San Diego"
Separate Keywords and phrases with commas please. *Important* - we accept 1 logo or 1 image to be included with your listing. Images and logos will be sized to approximately 250x250 pixels. Please include what business the image belongs. If you do not include an image or logo with your listing, we create one out of a screen shot of your website.